Paper Palette: Life is wonderful with you!! Before we talk about my new project I would like to thank all of you for appreciating my last card. And I would love to welcome Sindhu Kanagavel for joining us. Coming back to the current project. I loved making it, but this time its neither a card nor a tag. I have tried something new, a LAYOUT. That is what I like about crafting. Just like Medical Science it has wide horizons. All you have to do is to keep expanding your wings. Here is a sneak peak of the Layout. I got inspired by Chirali's moodboard on the Lulupu. I have tried to incorporate most of the elements of the moodboard i.e. 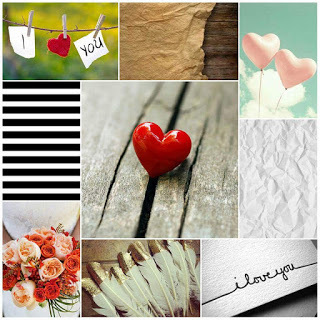 Hearts, stripes, crumpled sheet, flowers with leaves, "I love you"sentiment, feathers(with golden tips), thread, red, pink and craft colours. To make this LO I first took a craft colored sheet with (golden tinge) from an old wedding card and distressed its edges with scissors and slightly pink and black shades of something..(suspense...learned to create suspence from Pooja from reusing,cards & quilling ). Attached this sheet to a black one with distressed edges. Then glued black(ish) strips from PP at diagonal ends that I had created long time back following Pooja's pictorial. Attached a lace again distressed in black and pink shades. Took a black piece of sheet and crumbled it. Uncrumbled it taking care not to tear it and applied gold acrylic paint on the raised area using brush. Attached it over the base and covered it with blackened gauze pieces. Over it added a circle distressed pink, a photo area , sequins, some hand made flowers and drying leaves and feathers from garden. Two hearts were added using foam tape to give some dimension. 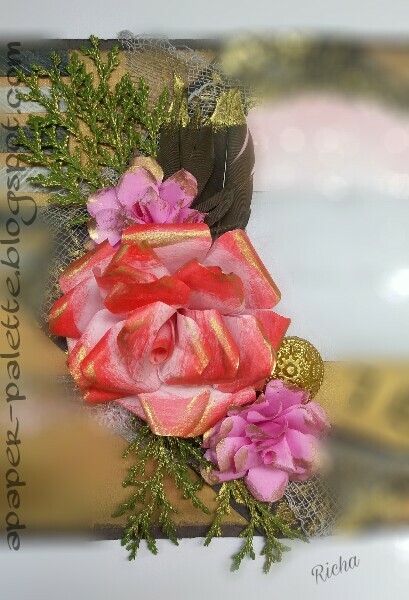 One was distressed and covered with black twine and other covered with pink loose glitter. 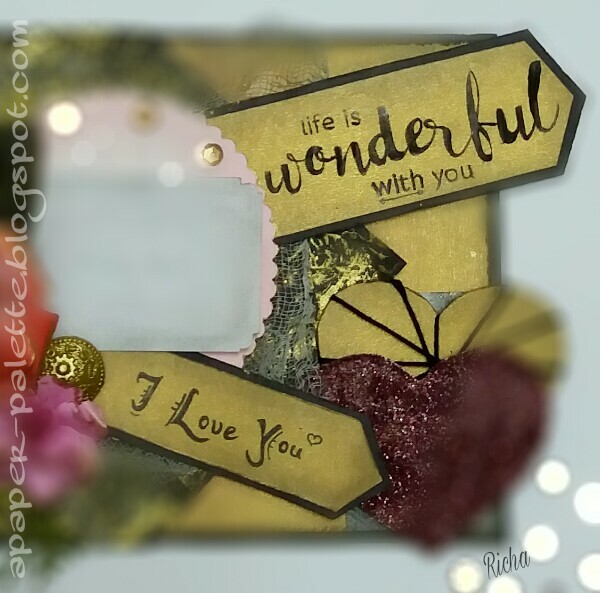 Used two sentiments, one was stamped("life is wonderful with you") and other hand written(" I love you"). 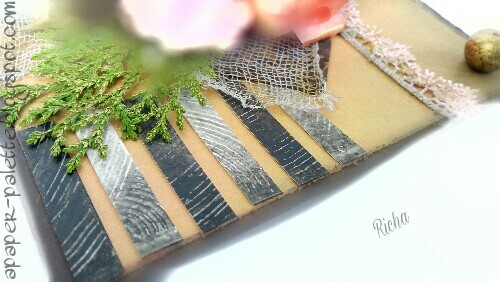 Distressed its edges too..
(using an old makeup kit no longer in use:Two benefits-1. So many shades.. 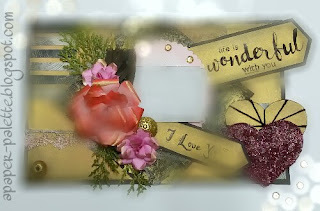 Finally added golden tinge to everything ..the flowers, the leaves, the gauze..(Hope I haven't overloaded it with gold). Here is the final LO.. If you liked the layout do leave some love below. P.S. : While handling loose glitter apply some talc powder on hands..the glitter won't stick to your hands. 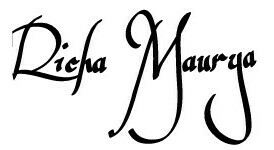 And if you decide to follow me do leave a comment below so that I can drop by your blog and leave some love. Happy Crafting. 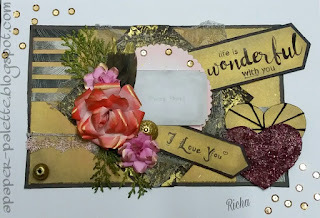 Ha ha..had fun thinking about the suspense !Good to see you trying new things .I loved the floral cluster and over all design and those strips look fab ! A very nice layout and wonderful color choices too. 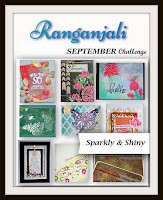 Lovely colours and flowers, many thanks for sharing with us at Penny Black and More challenge. Lovely layout with beautiful elements! Love the way of reusing old stash & especially an old make up kit! 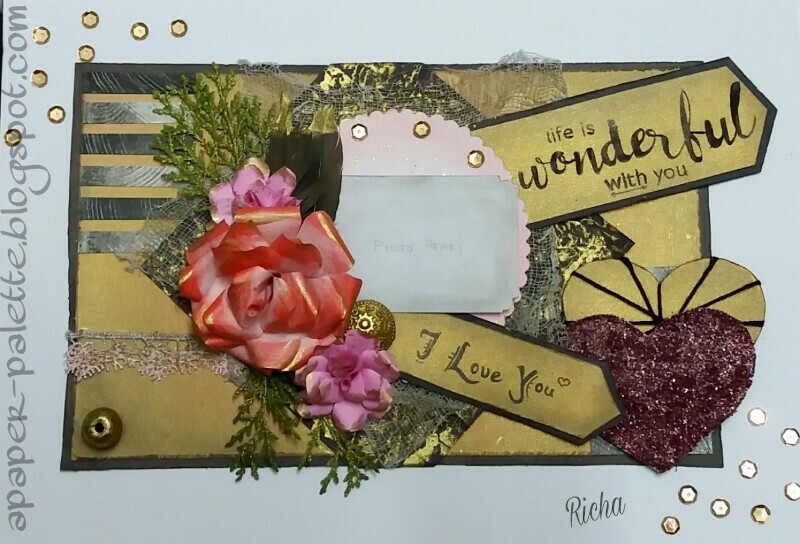 A gorgeous layout, Richa! I love your unique design and creativity! I usually only make cards so I enjoy seeing projects like this! Beautiful card! 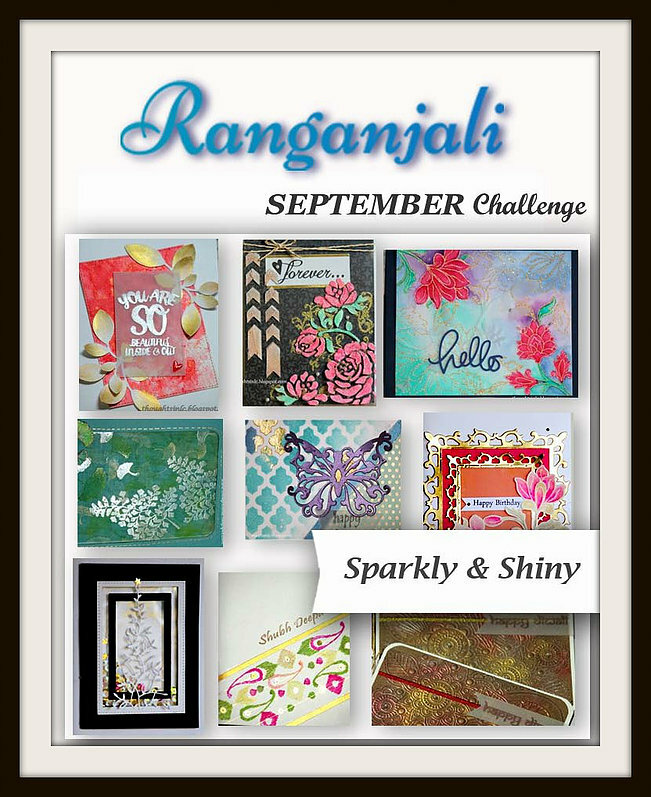 I love all the colorful and elegant details.Thanks for sharing this lovely card with us at ATSM challenge blog–please join us again soon! Very pretty and elegant card! Thank you for joining us at ATSM! Such a beautiful, romantic LO, Richa! Lots of little details and perfect embellishments. 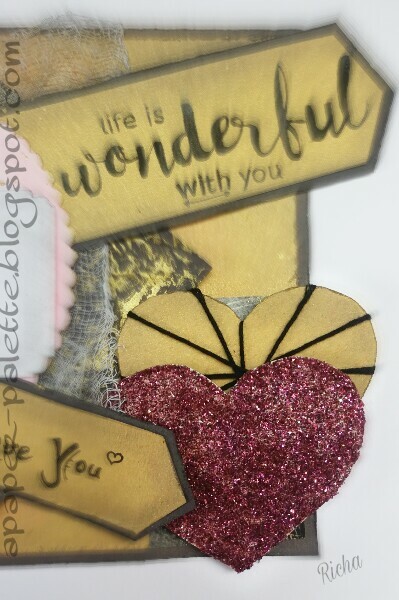 Such beautiful colours , a lovely layout and I love your embellishments. Thank you for sharing your wonderful creation with us at Sparkles a Monthly, hope to see you again next time..